Here is a weather freeform crossword puzzle to complete with a list of 15 theme related words. 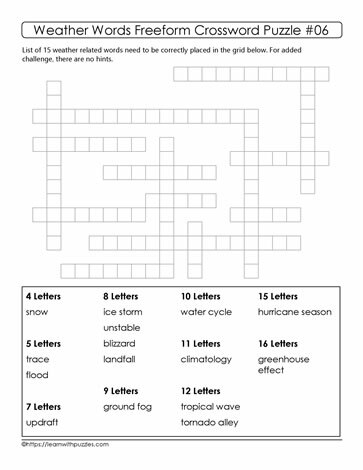 Students learning about global warming or climate change or weather will have fun completing this puzzle as they correctly place the words in the blanks in the crossword grid. Have students work individually, in pairs, or as part of a group to help build a stronger vocabulary based around theme words. This puzzle is also suitable for home schoolers and as a resource for tutors supporting learners outside the classroom.